The assault is the latest act of violence targeting security forces at high-profile sites in France. PARIS – An assailant wielding a hammer attacked Paris police guarding Notre Dame Cathedral on Tuesday, crying, “This is for Syria” before being shot and wounded by officers outside one of France’s most popular tourist sites, authorities said. 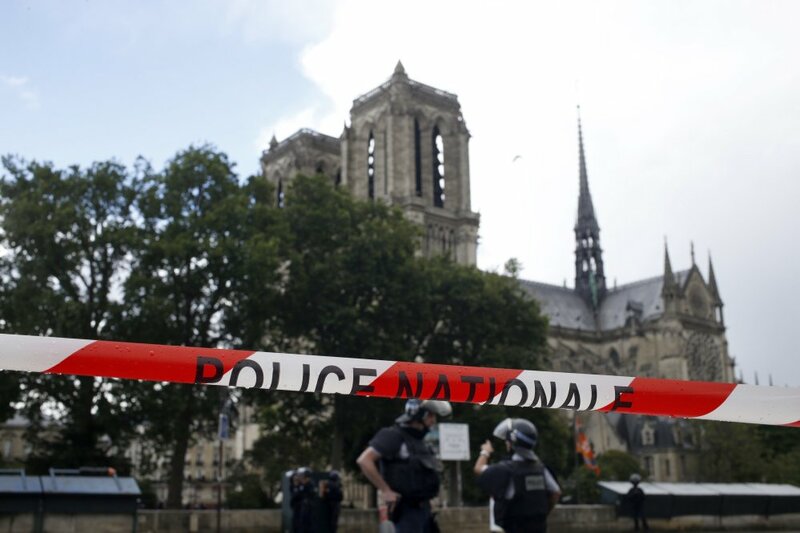 At least 600 people were blocked inside the iconic 12th-century church, while others fled in panic from the sprawling esplanade outside as police combed the area in the center of the French capital. Interior Minister Gerard Collomb told reporters that a police officer in a three-person patrol was lightly wounded in the attack, and the assailant was shot and wounded by a fellow officer. The attacker’s condition was being evaluated. “A person came up behind the police officers, armed with a hammer, and started to hit the police officer,” he said. The man cried “This is for Syria!” but said nothing else indicating a motive or a link to extremist groups, Collomb said. No group immediately claimed responsibility, and Collomb said he appeared to have acted alone. “We have passed from a very sophisticated terrorism to a terrorism where any instrument can be used for attacks,” he said. The incident happened around 4:20 p.m. A large number of police cars descended on the Ile de Cite island in the Seine River, where the cathedral is. Among the several hundred people ordered to remain inside the cathedral was former U.S. Ambassador to the United Nations Nancy Soderberg. She was admiring the church’s stained glass windows when a French announcement came on urging those inside to stay calm as police dealt with an incident outside. The visitors got nervous when they were told soon after that the doors were closing and everyone had to stay inside, Soderberg told The Associated Press from inside Notre Dame. “It was really scary; we had no idea if there were any accomplices inside,” she said. Lawrence Langner, a 73-year-old American visiting the neighborhood just across the Seine River from the cathedral, told The Associated Press that he suddenly heard a commotion and two gunshot-like sounds. Journalist David Metreau, who said his office overlooks the square that fronts Notre Dame, tweeted that there were two noises that sounded like shots. Looking down from his office, he saw a man not moving on the square. Officers then checked the man’s pulse, and medics eventually came and took him away on a stretcher. Soderberg said those inside the cathedral remained calm and orderly throughout despite not knowing what was happening, though “everyone was very quiet and very scared” when police came in to check the cathedral’s pews row by row. She tweeted a photo from inside the Notre Dame showing those locked inside putting their arms in the air, as instructed by police. The attack came the day before new President Emmanuel Macron unveils his first efforts against terrorism, which Collomb called the president’s top priority. In April, an attacker opened fire on a police van on Paris’ Champs Elysees, killing one and gravely wounding two others. The attacker was shot dead by police. Angela Charlton, John Leicester and Sylvie Corbet contributed to this story from Paris. Sylvia Hui contributed from London.